I had heard about it for good reason. Through the guitarist in Cease & Desist (Brent Howard Knudsen) I had met quite a few people. So, I had met Tanya Panrucker, her sister Susan Smith and their mom Judy Panrucker. Judy ran Johnny’s Place. It was small; barely 40 seats nestled in a rustic surround which, from what I had heard, was mostly known to have the best breakfasts around. I then heard a while later that at night the place was starting to go off….they were getting in some great talent. Judy ran into me at the bank one day and asked me to stop by – and suggested that maybe I could play there… but at the time, I was working 7 nights a week with two different bands so my time was pretty much used up for me to do ‘Johnny’s Place’. The money they could offer was not huge due to their limited seating however Judy had said that if I were to play there, she could make it up to me with food and beverage etc. Judy is and was always a very sweet person. One night I happened to go into Johnny’s Place with my wife Joanne just to check the place out. Judy’s boyfriend Barrie served us. He went on to explain that in the 80’s, he would often frequent bars where Trama played. He knew that I would sing Roxanne at the beginning of the 3rd set, so he’d always make sure to chat up a gal on the previous break and ask her to dance the first song knowing it would be a ballad. Ya… so I started hanging out there. Because it was a restaurant, my whole family started hanging there. One of the last wonderful and deep conversations I had with my daughter Carolyn was there… a week before she died. Johnny’s Place started to mean the world to me as it did to a lot of musicians. It was just plainly magical. Eventually, I wasn’t working Sunday nights any more, so I was able to start doing a solo there the odd time… then….I started doing every Sunday there.. it was just too much fun! It ended up being even much more so incredible! My old pal Tommy Stewart started sitting in with me on drums and then the great Lee Worden on bass/vocals and the incredible Mike Norman on keys/vocals and sax who truly was probably the greatest talent I have ever known in my life. I hate cancer… taking a life so young with such huge promise. But…. What a band! Probably the best band I have ever had ‘musicianship wise’ in my life. With Lee and Mike I was constantly simply trying to keep up. All in this little wee 40 seat place! Crazy! Here’s a great shot from one of my Sunday gigs at Johnny’s Place with Jonas Falle on guitar beside me and the incredible Beverley Staunton. Beverley moved to LA a little while after this picture was taken and has had a huge career down there. Amongst a myriad of other gigs, she was the voice of ‘Dancing with the Stars’. Enjoy this video from a TV news magazine that had heard about ‘The Magic’ of Johnny’s Place. Thank you Judy, Barrie, Susan and everyone who made me and my family part of your family… and for introducing me to some of the greatest musicians I have ever known. The following video was shot on a Monday night. Russell Marsland (you’ll see him on guitar singing) had the place hopping every Monday. Great jamming… the night the cameras were there I was sitting in with my upright bass… which I had just acquired and was trying desperately to get a hang of. Russell is a magnificent musician, guitarist/vocalist and his girlfriend Suzanne Gitzi (Raven) is one of the best female singers I have ever worked with. They are two of the most wonderful people I have ever met and I owe most of our friendship to Johnny’s Place. Interesting project. Doug Edwards… wow – what can I say. The guy wrote WILDFLOWER!!! I saw Doug play at The Sawmill Lounge at The Water Tower Inn with The Hans Staymer Band in Sault Ste. Marie when I was 17. James somehow heard that Jeff Neill, Michael Sicoly and I were to join Brien Armstrong (who he hadn’t meant) on the road in early 1976. He was thrilled for me (us)! He thought we were the cream of the crop in The Soo. James had decided to settle in the Sault for a bit. Some say he had met a girl there (true) – others thought he had grown tired of touring (questionable…due to what I witnessed from him later when we hooked up as Shama had become quite a rising star in the prairies)- but my personal thoughts were, he was suffering from Type 2 diabetes. James was always overweight…regardless, he was stationed in the Soo…ran the Sawmill Lounge (booking some of the greatest bands I have ever seen to date) and working night shifts the odd night a CKCY Radio as a Deejay. When he worked as a DJay at CKCY, he would get me, and sometimes Michael Sicoly up to the broadcast booth with him for the night and tell us endless ‘road stories’. He was so thrilled that we were heading out west. He loved telling us about all the things we’d see and witness… what a thrilling time in my life!! Hans Staymer was obviously on vocals (the blackest white singer ever), Wayne Kozak was on sax, Eddie Patterson on guitar, Doug Edwards on bass, Geoff Eyre on drums – I was watching with my mouth open. Incredible playing. He and Mary Garnett met in the early 90’s. When they released their CD, they asked me to play on a few gigs with them along with Marc and of course I was honoured to do so. 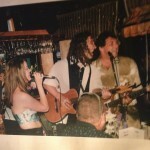 Loved this gig… I believe it was an Easter Dinner. There were wives, girlfriends, kids there…. but wow… I LEARNED! During set up I had my back to ‘audience’ side of the stage while I laid my cabling etc. I heard a voice calling out, ‘MIKE!!! – HEY MIKE!!!’. Now I worked with Mike Sicoly and Mike Frelone so I assumed the call was for them. I hadn’t been called ‘Mike’ since I left Sault Ste. Marie in 1976. As far as I knew the WHOLE WORLD knew me as MICK…. especially in the Vancouver area. Needless to say, I changed the subject and ‘had something else to do’. Maybe some of you may think badly of me… but I had two young children at home. No matter what my background was with Buck, there was no way in hell I was going to allow him into my home. He had obviously become an ‘unremorseful’ criminal…. OKAY…so drugs?? In prison???? What the hell? This was a PRISON… and not medium security either – and yet he’s saying we could get drugs?? Yes he said… whatever you want we have it here. Needless to say, we were a little freaked out about the way this was all playing out. So I said, you’re the promoter AND you’re in jail? He replied to the affirmative. Then pointing at the box, I said, wow… pretty cool swag! (And indeed it was… the emblem ‘Trama… Live At The Chain and Ballroom’ looked pretty cool. I remember Kathleen our light tech was particularly enamoured with a sweatshirt. We had these made up for you, but we need something in return… money…whatever you can afford or you trade us shirt for shirt. I remember Kathleen traded her shirt for the sweatshirt she loved… and on and on… I think I paid $10.00 for mine… and $5.00 for another…. We knew nothing about contraband…..
We found out a few days later that our friend Sandy Flett (who ran a concert T-Shirt company), had sent those ahead as a gift without telling us as a surprise for us! They were our shirts to start with!!!! Look at a few more videos for other stories…. By Mick Dalla-Vee on Friday, February 20th, 2015. 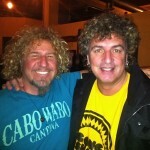 Sammy Hagar With Mick Dalla-Vee. Brothers separated at birth perhaps? Sometimes there’s never a dull moment – brothers from a different mother… or at least the same follicle family. The picture above was taken at the Gibson showroom in Toronto. Sammy was in Toronto for Music Week. He had just recently sold off his interests to ‘Cabo Wabo Tequila’ for high 8 figures and had reputedly invested a portion of it back to a rum company that was to be based out South Asia. Sammy was as smiley as you see in this picture. We didn’t talk music so much as just niceties and joked about how similar our hair and features were. 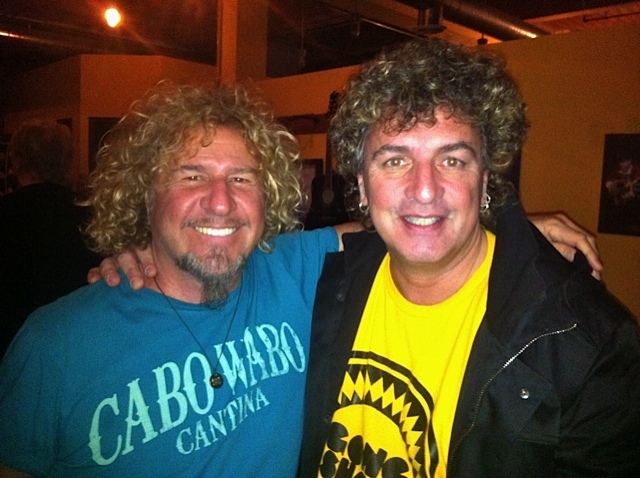 All in all a great experience… Sammy’s a good guy….